What is jQuery Bubble Scroll ? jQuery Bubble Scroll is an easy-to-integrate navigation asset that you can use on your website to display any kind of usefull informations. You can customize it a lot with some parameters to integrate it well in your website. There are two types of layout (square or circle) and you can put it to the left or to the right of the screen. You can check all of the available options on the demo page. Display any kind of usefull informations with HTML and CSS. Responsive : Bootstrap is NOT required (however, you can use it with no problem). Different display styles available (circle, square). Different positions (left or right). Appears on scroll but can also be always visible on the screen. 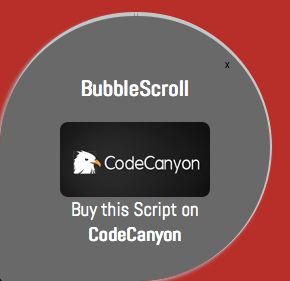 You can read the jQuery Bubble Scroll documentation by clicking here. Vegas Background jQuery Plugin for the demo page. jQueryDesk.com for some good tutorials & scripts. Follow me on CodeCanyon or/and on Twitter to be informed when I release a new item / update.